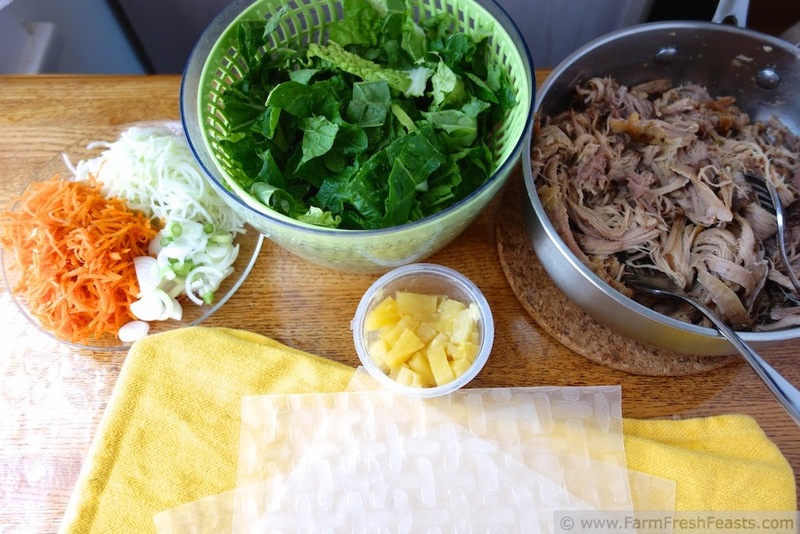 Kalua pig combined with shredded kohlrabi and carrots in a rice paper wrapped roll, sweetened with a bit of pineapple for an Island style meal. Yes, this is another way to eat that Community Supported Agriculture (CSA) farm share kohlrabi! Kohlrabi disclaimers aside, this is also a wonderful way to enjoy some Hawaiian flavors while keeping your house reasonably cool. Sure sure, you've got an imu [underground pit oven] in the backyard for your monthly luau . . . or perhaps like me you don't. Kalua pig cooks easily in the slow cooker [please not I said easily, not quickly--if you don't have Kalua pig already cooked you'll need to start this a day early]--but since making Kalua pig means you'll make a whole bunch of meat, it's delightful that the leftovers freeze well [add some pan juices to the container]. 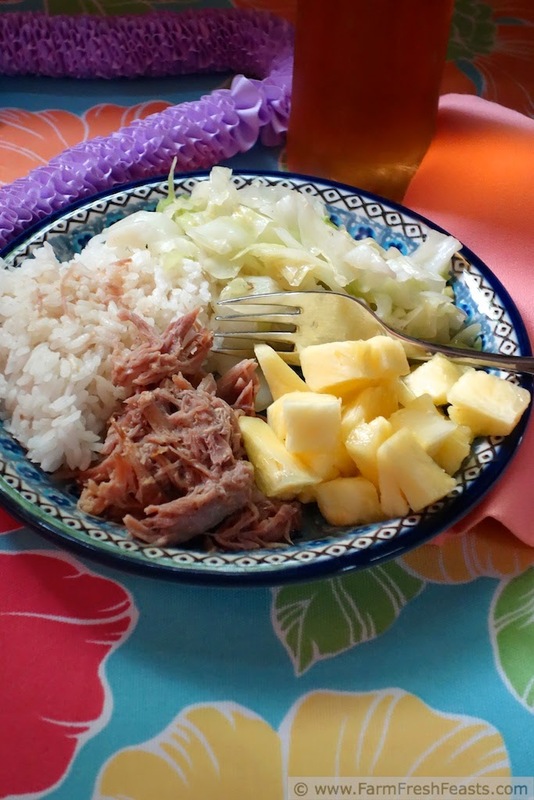 While we lived in Hawaii we enjoyed Kalua pig with sautéed cabbage, '2 scoop rice', and pineapple chunks. 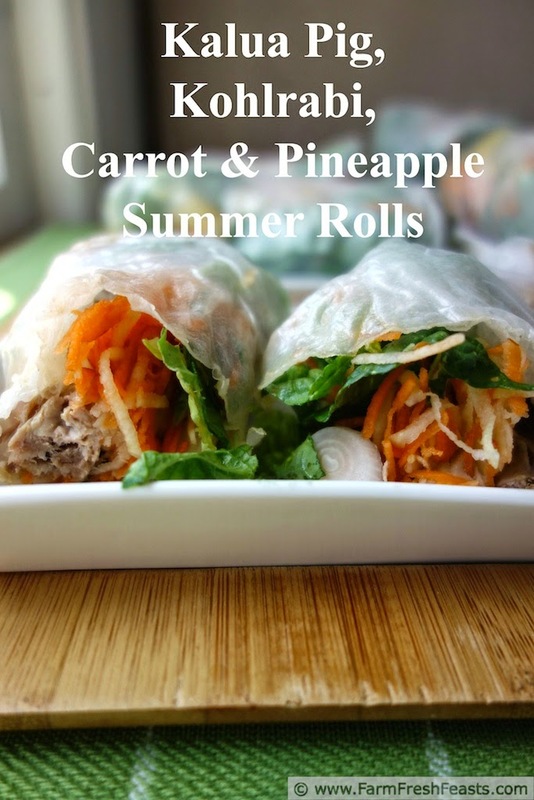 I decided to create a summer roll that combined many of the same elements, but in a cool and tidy* package. 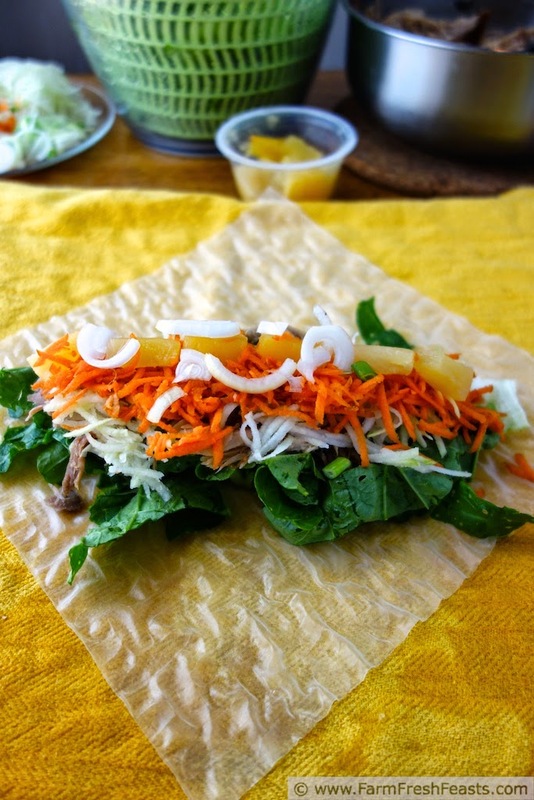 I used shredded raw kohlrabi instead of sautéed cabbage, rice paper wrappers in lieu of rice, added in some shredded carrot for color, and tucked the pineapple inside. This is a terrific hot weather meal--packed with vegetables and quite satisfying--keeping my kitchen cool. It travels well in a chilled bag, too, for summer picnics. For more recipes using carrots, please see my Carrot Recipes Collection. For more recipes using kohlrabi, please see my Kohlrabi Recipes Collection. For more recipes using salad greens, please see my Lettuce/Salad Greens Recipes Collection. For more recipes using pineapple, please see my Pineapple Recipes Collection. These collections are part of the Visual Recipe Index by Ingredient, a resource for folks like me eating from the farm share, the farmer's market, the garden, the neighbor's garden, and great deals on ugly produce at the grocery store. 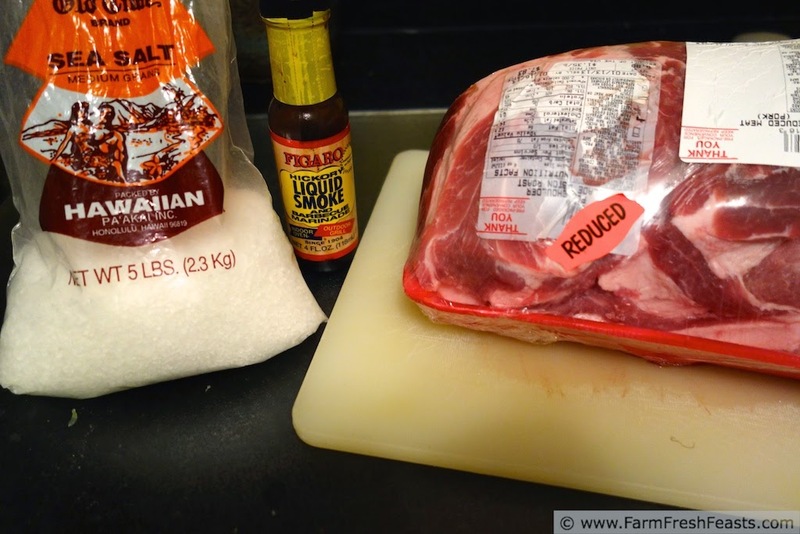 Here's a video of how I make my Kalua Pig in the slow cooker. Note: I didn't want a dipping sauce for these--I found with a higher pig to vegetable ratio than shown in my photos, the flavors were such that a sauce was unnecessary. 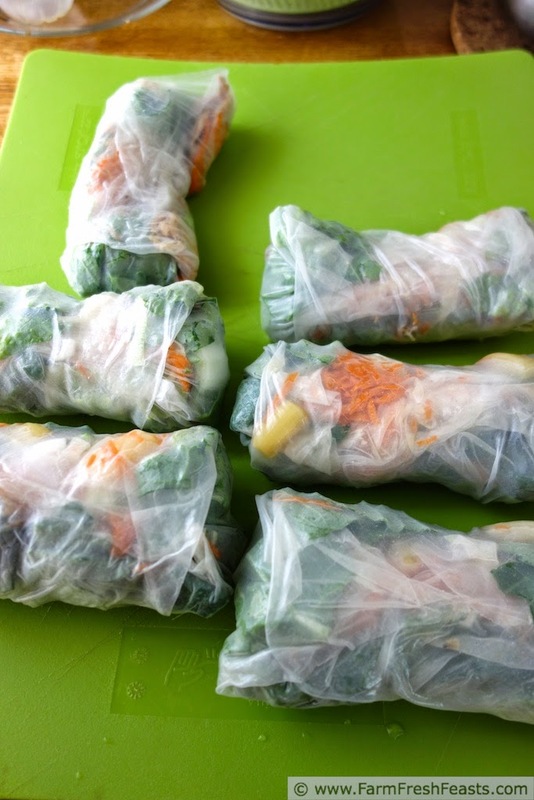 On a prepared spring roll wrapper, layer a small amount of each vegetable and ¼ to ½ cup of kalua pig. Top with a few pieces of pineapple. Fold in ends and roll tightly. Keep covered with a damp paper towel until you're finished rolling. Slice in half for easiest eating. *Well no, actually it looks to me like a Hobbit wrapped up in webbing by a giant spider. Perhaps some Middle Earth dwarves, too. I could inhale these too, despite my less-than-photogenic rolling skills it's a wonderful flavor. Oh wow, this sounds amazing. I am drooling thinking of all these flavors. Definitely bookmarking for later! Oh! Kirsten, This sounds amazing. I have wrappers! I am going to have to put the other ingredients on my shopping list. Thanks for sharing. I am stopping by from Clever Chicks Hop and definitely pinning this one. I love that the wrappers will keep a bit in the pantry until I've got my act together with the rest. Thanks for stopping by! You flavor combinations continue to amaze me, even if they do come from Middle Earth. My subconscious is trolling around Middle Earth or the people I live with forcibly brain wash me about these things. I dunno. Glad to amaze you. 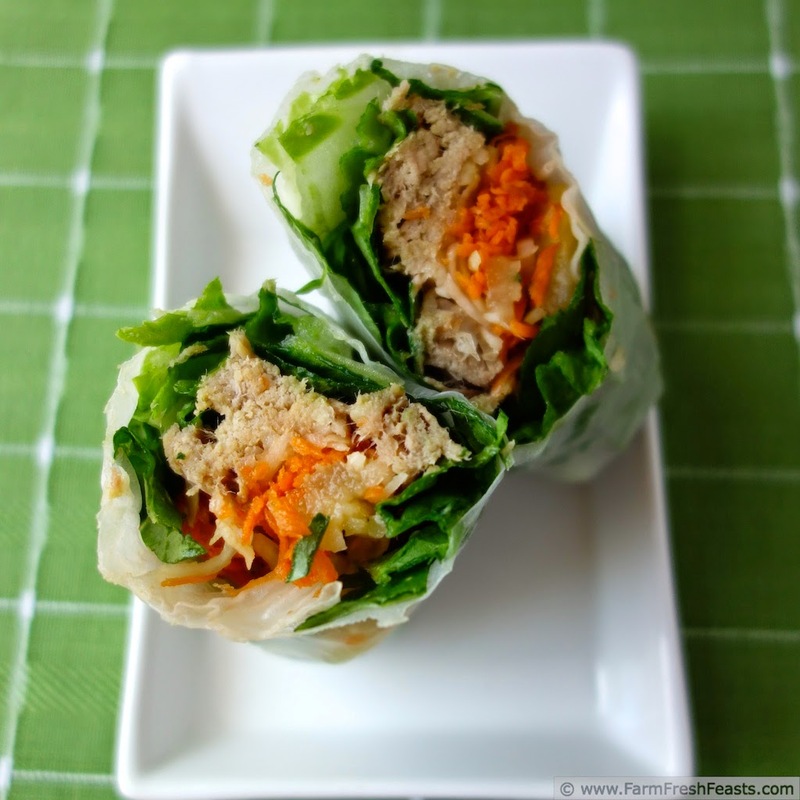 I'm always looking for a new recipe and your summer rolls look and sound wonderful. Very nice tutorial. Thanks for your kind words--and thanks for hosting! Kalua pig rocks. Thanks for the pin!